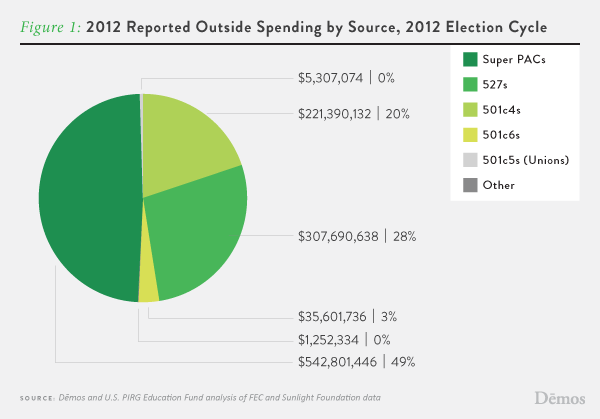 A new analysis of pre-election data from the Federal Election Commission (FEC) and other sources by PIRGIM Education Fund and Demos shows that outside spending in the first presidential election since Citizens United is living up to its hype: new waves of “outside spending” have been fueled by dark money and unlimited fundraising from a small number of wealthy donors. “While the results of next week’s contests are up in the air, one thing is clear: big donors and secret spenders have been drowning out the rest of our voices for months,” said PIRGIM Democracy Advocate Blair Bowie. 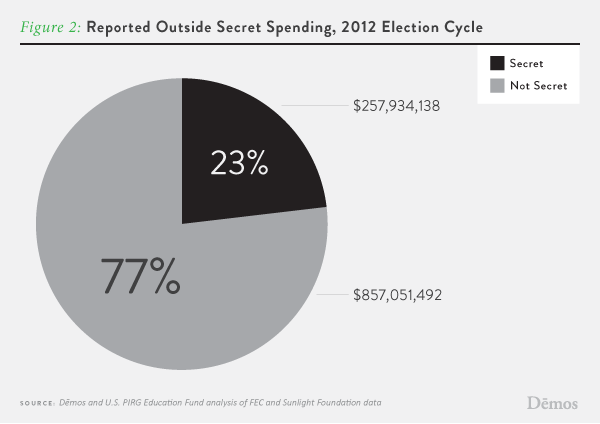 Outside spending organizations reported $1.11 billion in spending to the FEC through the final reporting deadline in the 2012 cycle. That’s already a 200% increase over total 2008 outside spending. Almost half of all reported outside spending comes from Super PACs, the independent expenditure-only committees created in the wake of Citizens United, and Super PACs continue to receive the bulk of their funds from a small set of wealthy donors making very large contributions. The two Presidential campaigns combined have reported raising $394.4 million from small donors giving less than $200, who are at least 1,972,000 individuals. 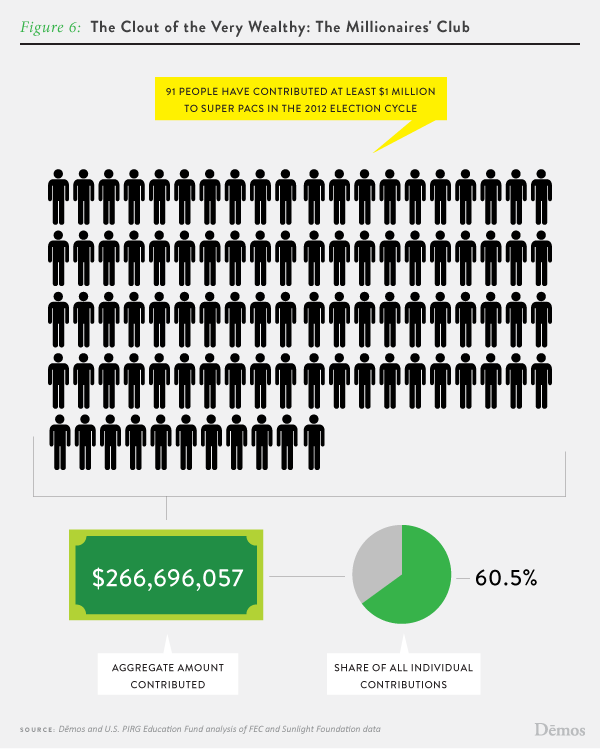 Just 629 big donors giving at least $100,000 were responsible for $393.4 million in Super PAC donations. “Because of their wealth and the Supreme Court’s equation of money with speech, those megadonors are able to amplify their voices to more than 3100 times the volume of an average small donor,” noted Bowie. Sheldon and Miriam Adelson, have given $52.2 to Super PACs in the 2012 cycle, which, though a significant sum, is just .21% of their net worth. 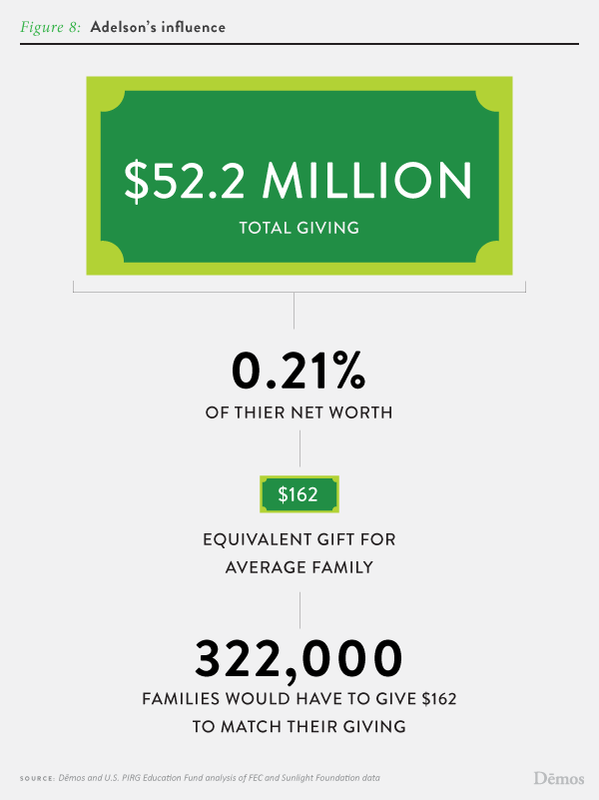 It would take more than 322,000 average American families donating an equivalent share of their wealth ($162) to match just the Adelsons’ giving. 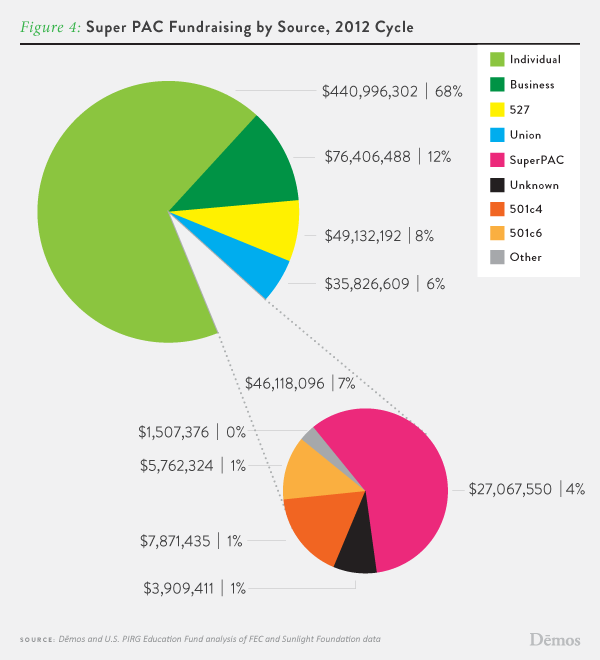 While it is likely that much of the business money coming into the elections is funneled through dark money sources such as the U.S. Chamber of Commerce, which so far has spent at least $35 million on races nationwide, the analysis found that business corporations remain the second largest source of Super PAC money, accounting for 12% of all Super PAC funds. Some of the largest and most active Super PACs receive a significant portion of their funding from businesses: pro-Romney Restore Our Future received over 20% of its funds from for-profit corporations. Of the $1.11 billion in outside spending reported to the FEC, nearly one-quarter, or $257.9 million, was “dark money” that cannot be traced back to an original source. Because of gaps in reporting requirements, spending reported to the FEC is only part of the picture. Groups are not required to report to any public agency certain spending that is intended to influence an election but falls outside of certain time windows before that election. 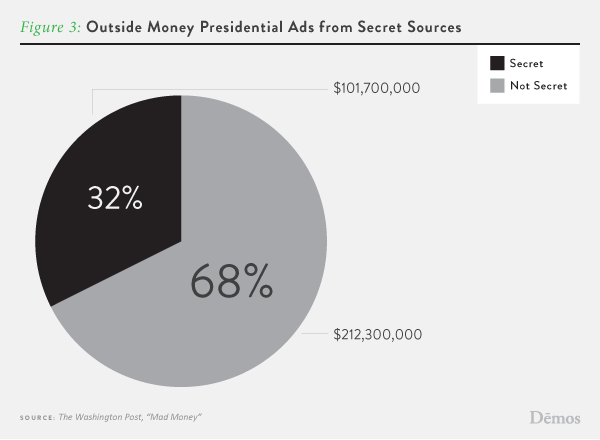 When all types of outside spending on television ads related to the presidential race are taken into account, 32% the spending has come from by “dark money” groups that do not disclose their donors. PIRGIM and Demos are encouraging every eligible American to go to the polls by November 6th to push back on the power of big money. This is the third release in the PIRGIM Education Fund and Demos series of analyses on the role of money in the 2012 elections. Previous reports are available here and here. Today’s release shows a sharp increase in the amount of secret spending reported to the FEC, as we would expect given the proximity to the election. The organizations plan to release a short post-election update on November 9 and a comprehensive analysis of election fundraising and spending in January 2013.